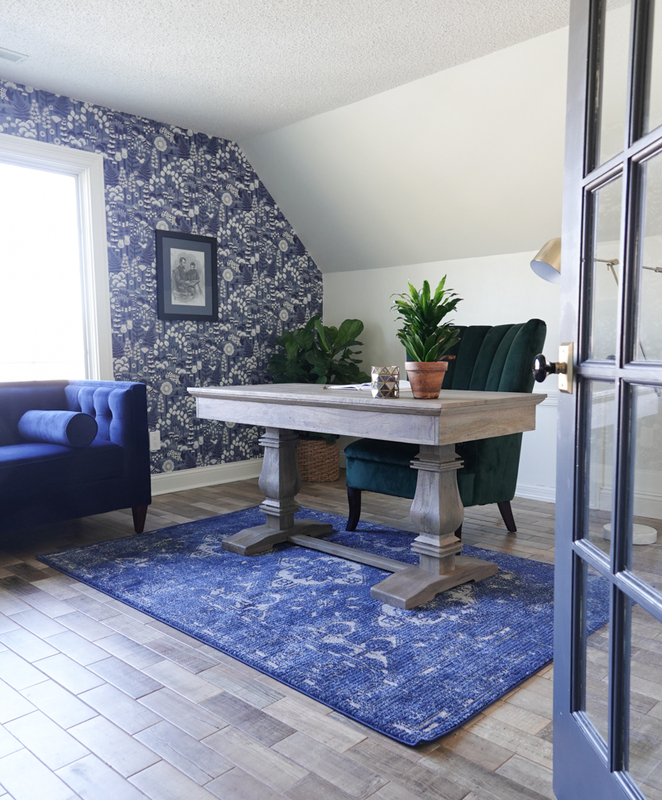 Navy Home Office Reveal - Sincerely, Sara D.
I recently remodeled what was our kids’ playroom into a home office. Now that our kids are getting older, a designated play area wasn’t really necessary, and my husband and I really needed a space to work. 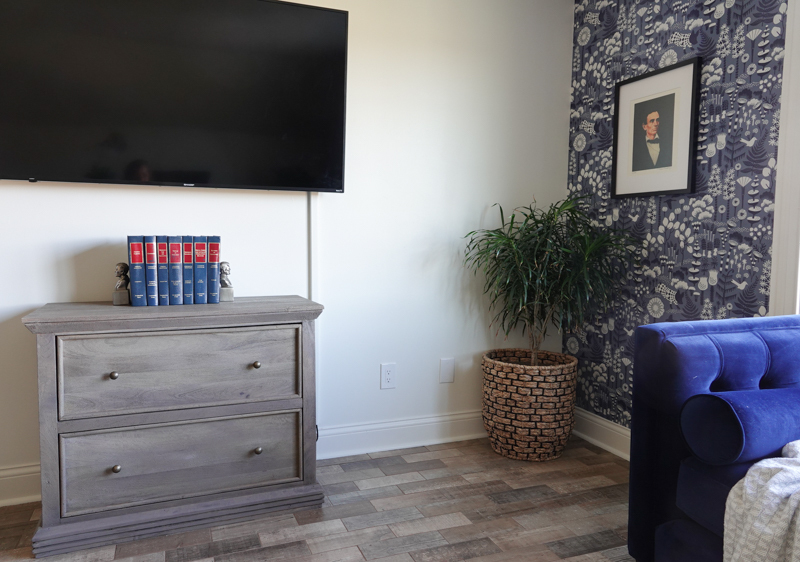 I was excited to partner with The Home Depot on decorating this room, and every beautiful item was found online. 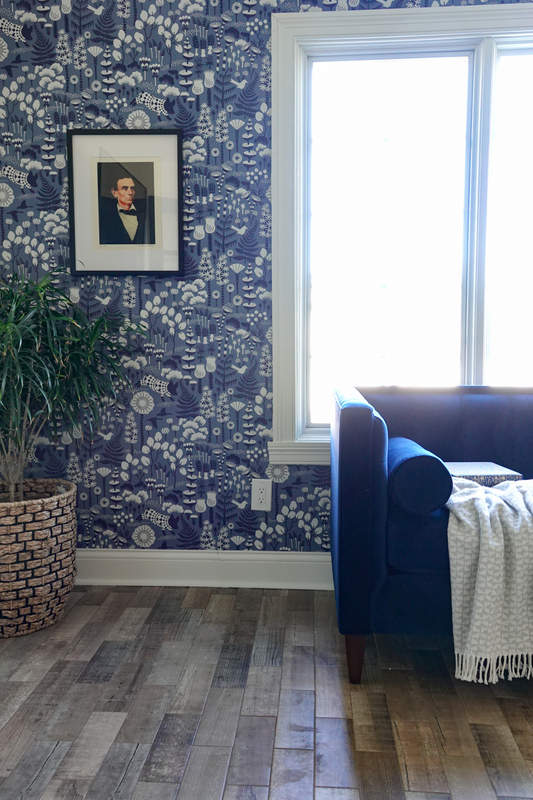 I was able to find the perfect balance of some fun decor pieces that fit my more creative spirit while bringing in the more traditional look my husband prefers. 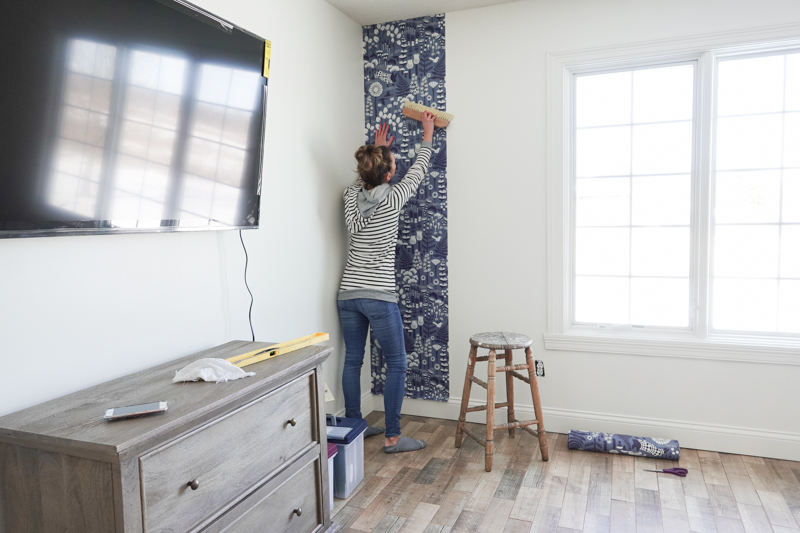 I managed to persuade my husband that work doesn’t need to be boring and hung this gorgeous Hoppet Blue Folk Wallpaper. It instantly brought fun into the space. 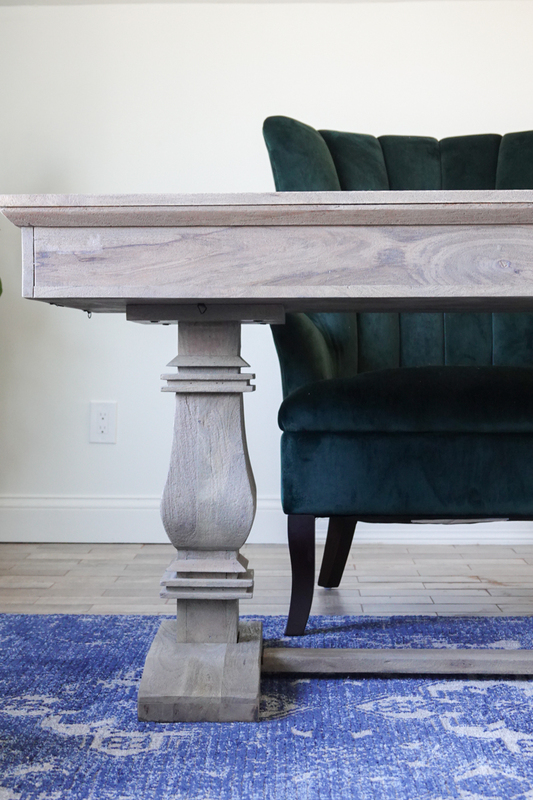 We will be building a credenza on the wall behind the desk for my computer and storage, but we wanted a writing desk in the space and this Aldridge Antique Grey Desk is even more beautiful in person. It is simple but sophisticated – exactly what we wanted! 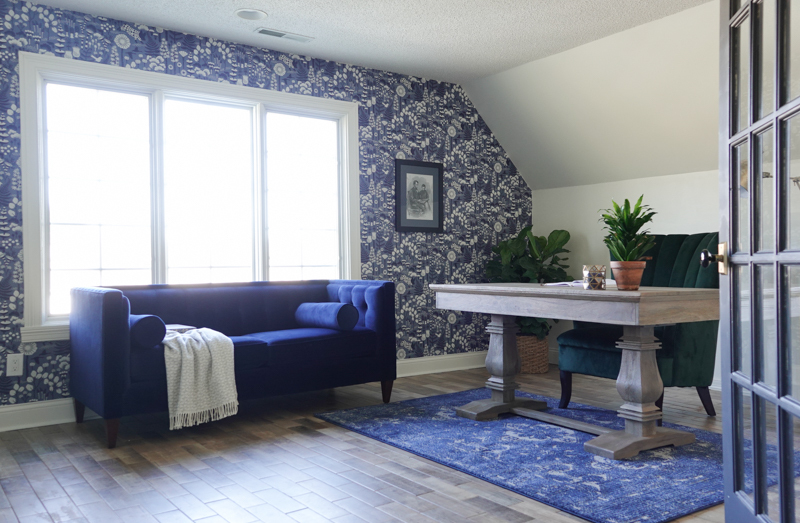 The Vintage Ellie Navy Rug softens up the flooring. 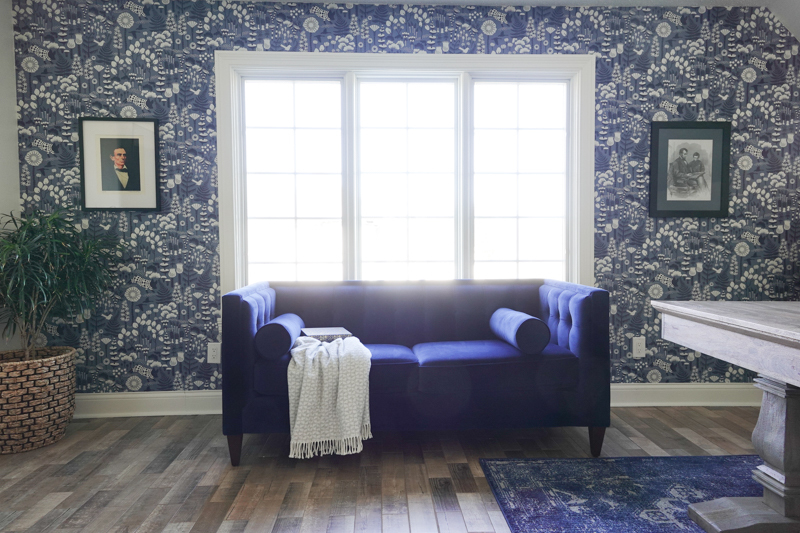 It ties in the loveseat and works well with the wallpaper. 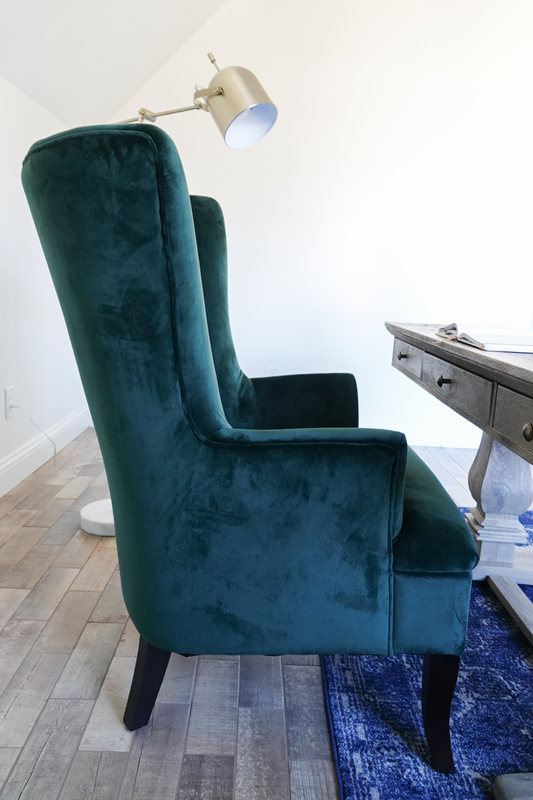 I am loving all things velvet, and this gorgeous Carlotta Emerald Velvet Club Chair is stately and so comfortable and the pop of green is perfect for the office. 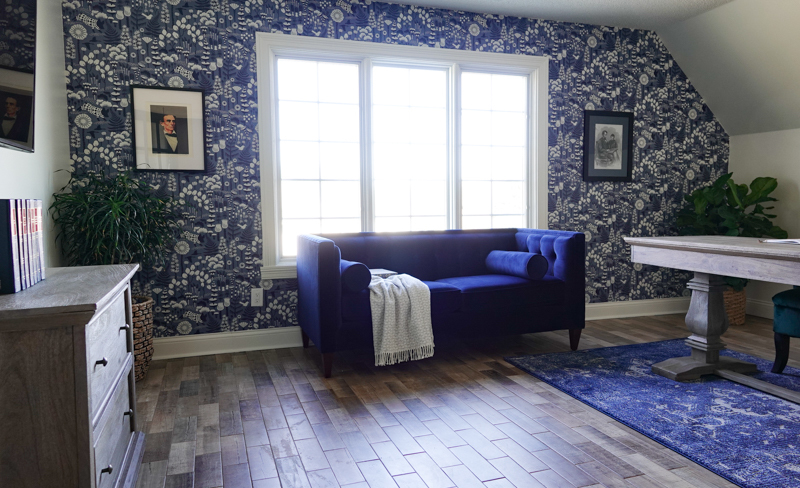 Although I love them all, my favorite piece in the space is this Jack Navy Blue Tuxedo Loveseat. 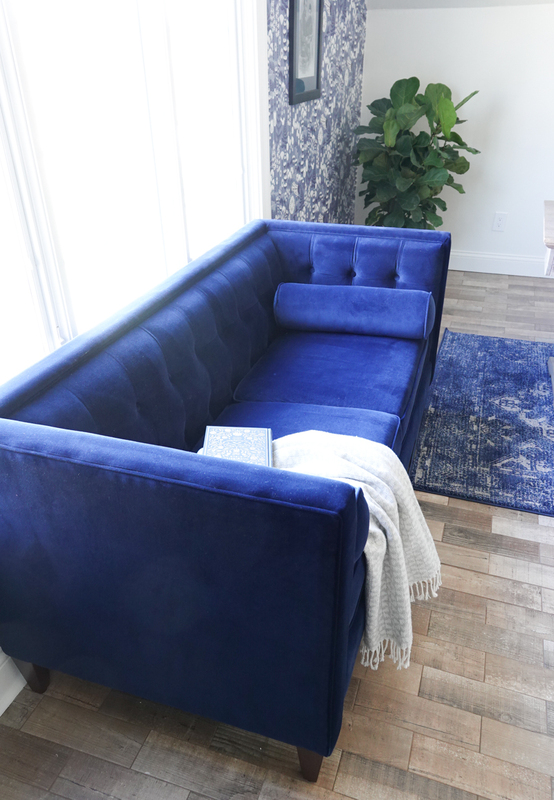 It is the perfect little sofa for an office, and the navy, tufted details and velvet make for the perfect piece of furniture. My husband always requests filing cabinets, but they are usually ugly. 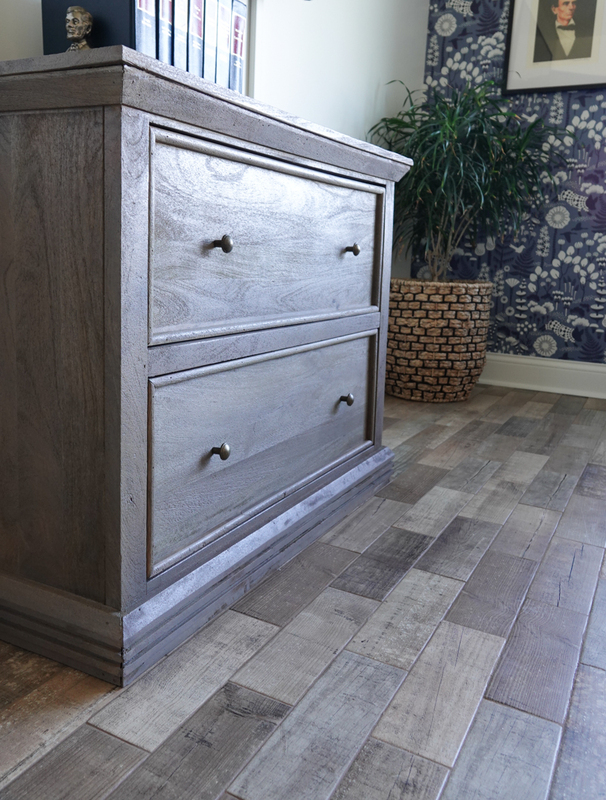 I was so excited when I discovered this Aldridge Antique Grey File Cabinet – beauty and form can exist! 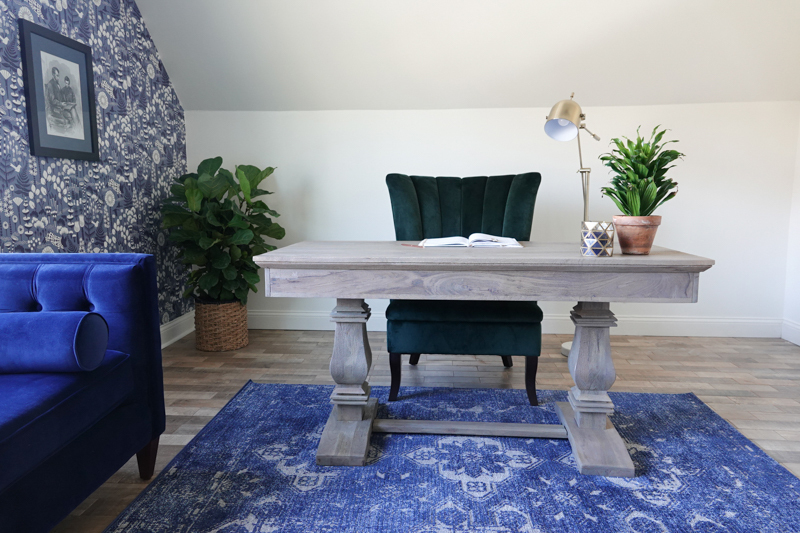 Our new home office came together thanks to gorgeous furniture pieces from The Home Depot! I ordered everything online, and it came right to my doorstep. Now that is the way to shop! This is a sponsored post written by me on behalf of The Home Depot. All opinions are 100% mine. I understand Mira! Working for clients approval ends up in a design you typically don’t love, doesn’t it? 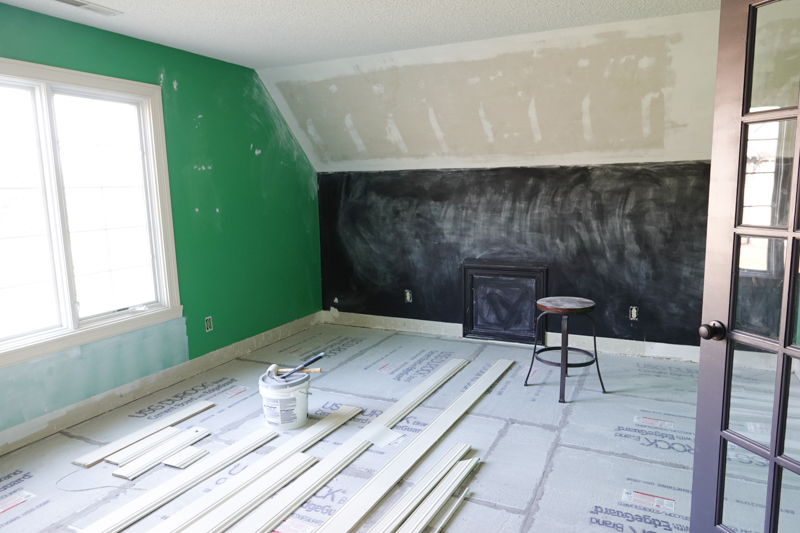 What is your flooring? I love it! Thank you! It’s tile (also found at Home Depot). I’ll be sharing more on it soon!